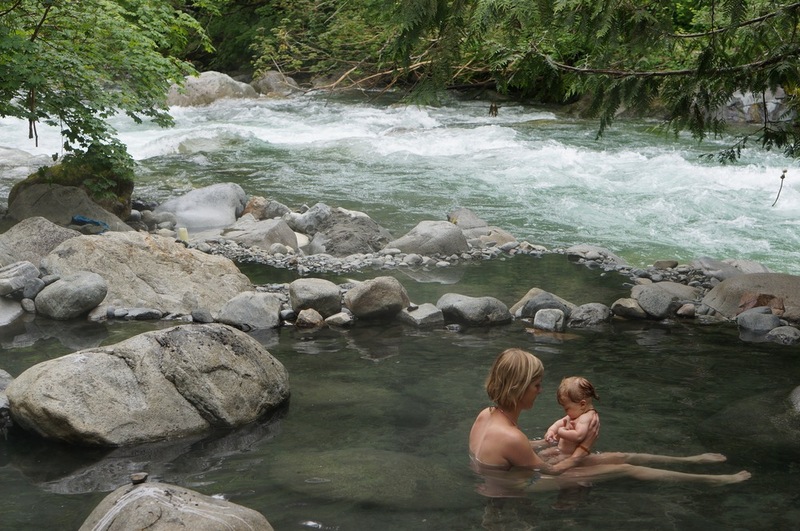 We first heard about the Sloquet Hot Springs from a Pemberton couple while we were visiting the Sunshine Coast. The Hot Springs sounded magical and right up our alley: remote, secluded, totally natural and raw, and slightly difficult to access. The idea was to follow a loop route from Vancouver through Chilliwack to Sloquet, up to Pemberton, back down to Whistler for some biking, and finally back to Vancouver. The route to Sloquet was all logging roads and required 4x4, but now that we had the Earthroamer, we figured it would be no problem! Our adventure began smoothly. We drove by Harrison Lake near Chilliwack and enjoyed some beautiful views from the logging road. For the most part, the logging road was pretty tame, with only a few rough patches... until we somehow took a wrong turn or missed a turn, we're still not quite sure which! The Sloquet Hot Springs are not exactly your run of the mill tourist destination with clearly marked signage, or any signage for that matter, which is partly what made it so appealing to us. And the directions we found online were pretty basic. We wish we could offer some updated or more detailed instructions, but the truth is, we got off track and ended up on a super sketchy road... so sketchy that we were too nervous to remember to pull out the camera and take any photos of our trials and tribulations. Let's just say we tested the off-road capabilities of the Earthroamer to the max and luckily she passed! At one point the driver's side of the vehicle was brushing against a rock bluff as the passenger side tires were on the edge of a 50 foot cliff! At another moment we were climbing a 30+ % grade when we came to a large rock spanning the road that was right at the limit of the Earthroamer's 9 inches of clearance. A couple of the culverts even tested the departure angle of the truck as we narrowly escaped, scraping the bottom of the truck box as we powered out of the hole. This was easily the most adrenaline we've ever experienced while driving despite not surpassing 15 kms/hr. The only advice we can offer is that if you stop seeing the yellow kilometer markers along the side of the road and you start fearing for your life, you've probably taken a wrong turn -- go back to the main road... if you can! When we finally got back on track and stopped, we all needed a stress-break after our extreme off-road adventure. Jenna screamed irrationally at Josh for 10 minutes, Josh yelled into the wind, Arjuna went and played outside on a log, Lux made cute little worried faces, and finally everyone had a quick but thorough cry. After the intensity of losing Zama in a completely unpredictable accident, our confidence in reality and our safety -- and our ability to keep those we care for safe -- is at times, quite fragile. Despite the personal work we've done, there is still no way to tell when we'll be triggered and sent back into the emotional place where we're fighting for Zama's life. Perhaps only time will change this. The inside of the cabin seemed to match our emotional state and was completely disheveled! What you cannot see in the photo below are the shampoo and soap bottles strewn all over the bathroom and the inside of the fridge covered in a delicious mixture of mustard, milk, and hot sauce. Somehow, amidst the extreme ups and downs, the lids actually came completely off these items! When we finally arrived at the Sloquet Hot Springs after what seemed like an eternity, with physical and emotional ups and downs, we were relieved to find basic but picturesque camp sites. There were no hook-ups, of course, but this is why we chose the Earthroamer -- we have the capacity for enough fresh water and solar for at least a week. The campground is run by a couple from the local First Nations band who reside in a tent and take care of the place charging only $15 per night. Day access to the Hot Springs is $5. The 10 minute hike (15-20 minutes with kids!) down to the Hot Springs was part of the adventure, but also increased our anticipation. We had spent many hours on the road and expended a lot of emotional energy to get there. Would they be worth the struggle? As we see steam rising from the woods below, we know we're getting close. Deep in the mountain forest, past a river, down the path, over a log, and past a steaming waterfall, we find a covered shelter to hang our clothes and towels. We read online that bathing suits are optional at these Hot Springs, and the multitude of burnt tea lights suggest that this would be a romantic candlelit experience for a couple. But we enjoyed them just as much as a family in the daylight. These are the most epic hot springs we've ever visited. They were the perfect temperature for Lux. Arjuna spent hours climbing around exploring, stacking rocks, and playing with the sand and clay beneath. And for us parents, the beautiful natural surroundings and the springs provided a connection to nature and some much needed heat therapy. Josh even braved the adjacent icy river to cool off. So was it worth it? Definitely yes. And even with kids, yes. With hardly any people, no stores, no cell service, and no entertainment aside from the hot springs and the trees, we found ourselves in awe, and transported back to a time when the connection between humanity and nature was more uninhibited. The challenge of getting there, and the intense energy of this special place once we arrived, was a special time for our family to reconnect to each other and at least partially access something more primitive, untouched, without the stamp of civilization. Yes you should go!